Pictured, clockwise from top left, are Chester S. Stachewicz, Joseph P. Friel, Francis T. Hogan, Martin L. Pavlock, Thomas L. Kemp, Mark M. Friel, John P. Hajduk, and Donald S. Fafinski. The Buffalo Diocese on Tuesday released the names of 42 priests who were removed, retired or left the ministry after being accused of sexual abuse of a minor. Several of the priests named served in churches in Chautauqua County. Several priests accused of sexual abuse of a minor by the Buffalo Diocese served in Chautauqua County churches at various times over the last several decades. The diocese on Tuesday released the names of 42 priests who were removed, retired or left the ministry after allegations of sexual abuse were reported since 1950. Included in the list are priests with more than one allegation; more than half on the list have since died after being accused. In a statement to The Post-Journal, a spokesman said the diocese could not get into specific dates of when it received allegations of sexual abuse against the priests on its list. No formal statement was being made Tuesday, the spokesman said. 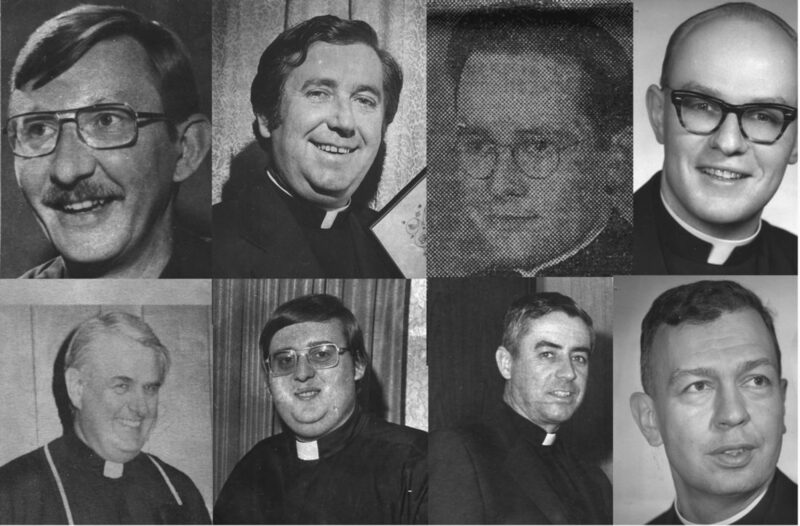 The following are priests named by the diocese that served at local churches. The information was collected from various articles that appeared in The Post-Journal. The Rev. Chester S. Stachewicz was an associate pastor of St. James Catholic Church in Jamestown and was co-moderator of a local radio program “Conversations About Catholics.” He studied at the University at Buffalo and St. John Vianney Seminary. In March 1980, Stachewicz was quoted in the newspaper regarding the importance of going to mass regularly in order to marry in the Catholic Church. The Rev. Thomas L. Kemp became pastor of Our Lady of Victory Catholic Church of Frewsburg in January 1971. He replaced the Rev. James P. Hayes, who was moved to the All Saints Church of Buffalo. According to news clippings, Kemp completed his studies for the priesthood at Our Lady of Angels Seminary at Niagara University and was ordained in June 1952. A Batavia native, Kemp did graduate work at Canisus College, St. Bonaventure University and the University at Buffalo. He also served as an assistant at St. John’s Church in Jamestown; Holy Name of Jesus in Buffalo; St. Francis in Tonawanda; Most Holy Redeemer in Cheektowaga; St. Bonaventure in West Seneca; St. Agatha’s in Buffalo; and St. Joseph’s in Buffalo. Kemp was moved from the Frewsburg church in April 1976 to pastor of St. Mary’s Roman Catholic Church in Holley, N.Y., on April 24, 1976. The Rev. Francis T. Hogan was ordained in October 1946 at the Seminary of Christ the King at St. Bonaventure. Shortly thereafter, he became pastor of the Immaculate Conception Roman Catholic Church in Cassadaga. He replaced the Rev. Paul R. Juenker, who was moved to a parish in Buffalo. According to a story in the Nov. 4, 1946 edition of The Post-Journal, Hogan was a graduate of St. Bonaventure and pursued studies in theology. He taught religion at St. Mary’s High School in Olean and St. Patrick’s in Randolph. Hogan conducted religious vacation schools at St. Anthony’s in Fredonia; St. Mary’s in Mayville; Prince of Peace in Niagara Falls; and St. Mary’s Pavilion. A news clipping from 1949 said Hogan was moved to Our Lady of Perpetual Help in Buffalo after serving at St. John’s Church. The clipping did not mention when Hogan became an assistant at St. John’s. According to the Buffalo Diocese, Hogan died in 2010. The Rev. Martin L. Pavlock represented at least 12 Western New York parishes from the time he was ordained in 1966 through 2002. Pavlock, a Jamestown native, attended SS Peter and Paul Parochial School in Jamestown; Diocesan Preparatory Seminary in Buffalo; Christ the King Seminary in St. Bonaventure; and St. John Vianney Seminary. He was ordained to the Order of Diaconate during a March 5, 1966, service in East Aurora. Four months later, Pavlock was assigned to his first post at St. John the Evangelist parish in Sinclairville under the direction of the Rev. Richard Rutecki. In 1968, Pavlock became the assistant priest at SS Peter and Paul Roman Catholic Church in Jamestown where he began coordinating a number of clothing relief efforts and director for the young people’s recreational center in the church basement. In June 1969, Pavlock was transferred to Our Lady of Mt. Carmel Church in Silver Creek. He was assigned to St. Patrick’s in Lockport and Our Lady of Blessed Sacrament in Depew before being reassigned as associate pastor to SS Peter and Paul Parish in June 1973. In 1975, Pavlock wrote a column for My Viewpoint, a weekly Post-Journal feature that highlighted comments from different members of the area clergy. A farewell celebration was held in May 1976 when Pavlock was reassigned to St. Mary’s Roman Catholic Church in Lancaster. Between 1976 and 1983, Pavlock was assigned to Mother of Divine Grace in Cheektowaga and St. Barnabas in Depew. In July1983 he was named pastor of St. John Fisher Parish in South Dayton and St. Elizabeth Parish in Cherry Creek. During the 1990s, Pavlock was assigned to Our Lady Help of Christians Catholic Church in Cheektowaga before succeeded the Rev. Sebastian Pierro at Holy Trinity in Dunkirk in 1999. The Rev. Donald F. Fafinski was appointed pastor of St. John’s Church of Jamestown in the fall of 1991. Fafinski previously served as the associate pastor in Santurce and Trujillo Alto, Puerto Rico; St. Casimir in Buffalo; and St. John Vianney in Orchard Park. He served as a youth minister in Dunkirk and Fredonia, and taught at both Cardinal Mindszenty High School in Dunkirk and Archbishop Walsh High School in Olean. He was the principal of Cardinal Mindszenty High School until it closed in 1979. Fafinski attended St. Hyacinth Elementary School and Cardinal Mindszenty High School in Dunkirk. He was ordained on May 21, 1966. He attended St. John Vianney Seminary in East Aurora, and received a bachelor’s degree from St. Bonaventure University in 1977. Her received a master’s degree in 1979 in education with a certification in school administration and supervision. The Rev. John P. Hajduk served as a deacon of St. James Roman Catholic Church in Jamestown. He was ordained on May 1, 1976, by the Rev. Edward M. Head of the Roman Catholic Diocese of Buffalo St. Augustine’s Roman Catholic Church of Depew. He earned a bachelor’s degree at Canisius College and a master of divinity degree at St. John Vianney Seminary in May 1974. According to an issue of The Evans Journal from July 1982, Hajduk served as an associate pastor at Most Precious Blood Church. Hajduk was named pastor of St. Mary’s of Cattaraugus and Little Valley in 1991, according to the church’s history page. In 1994, the Rev. Joseph Janaczek was appointed as administrator until another pastor arrived. The Rev. Joseph P. Friel was pastor of St. Patrick’s Church in Randolph. He became pastor in 1977. Friel was previously the pastor of St. Bartholomew’s Church in Buffalo. In 1983, according to the Evans Journal, Friel was named pastor of St. Vincent de Paul parish in North Evans. According to the church history page of St. Mary’s Church of Little Valley, Friel served as pastor from 1957-58. He also served as associate pastor at St. Joseph’s North Tonawanda; St. Aloysius in Cheektowaga; Our Lady of Victory Basilica in Lakawanna; Fourteen Holy Helpers in Gardenville; St. John the Evangelist in Buffalo and the Blessed Sacrament in Kenmore. A lawsuit was brought against the Rev. Joseph P. Friel in 1994, alleging that he abused a teenage boy in the late 1960s, according to a report by Anderson Advocates — a Minnesota-based lawfirm that specializes in representing victims of child abuse. He died, in 1995, a little over a year after the lawsuit was filed. The Rev. Mark Friel, according to a March 1992 newspaper clipping, served as pastor of SS Peter and Paul Church in Jamestown. According to Anderson Advocates, a lawsuit was filed against the Rev. James H. Cotter in 2003 which alleged he sexually abused a child. His name appears on the list of credibly accused priests released by the Diocese of San Diego. The report lists Cotter as having served at Our Lady of Lourdes in Bemus Point from 1966 to 1978. He also served at St. Mary’s Church in Little Valley in 1951. According to a report from The Buffalo News in 2007, Cotter was accused of molesting a young boy in the late 1980s. The Rev. James A. Spielman was named in January 1988 by then-Jamestown Mayor Steven Carlson to Jamestown General Hospital’s board of managers. Spielman, a Buffalo native, came to the Jamestown church in June 1986 after serving in Portageville, Canaseraga, and at Aloysius in Springville. Spielman taught for seven years at Bishop Walsh High School in Olean. He was ordained a priest in May 1970 after receiving a bachelor’s degree from St. John Vianney Seminary. According to a report from Anderson Advocates, Spielman was accused in 1993 of sexually abusing a child. The Buffalo Diocese reached a settlement with the alleged survivor, and Spielman reportedly resigned. The Buffalo Diocese was established in April 1847 and comprised of eight counties: Erie, Chautauqua, Cattaraugus, Niagara, Genesee, Orleans, Wyoming and Allegany counties. The diocese currently includes 164 parishes with more than 300 priests. The diocese encourages anyone who feels they may be the victim of abuse by a priest to call the Victim Assistance Coordinator at 895-3010. Counseling is available, and information regarding abuse can be submitted to the Auxilliary Bishop and eventually the Diocesan Review Board. More information can be found at buffalodiocese.org/pgc-diocesan-policy-on-abuse#procedures.